Continuing studies show “weight losers” regain their lost weight from 80% to 95% in the following 3 to 5 years. So with the most commonly used weight loss strategy being calorie restriction or calorie counting, is it really working? Did you know other strategies have been proven to be more effective with long-term weight loss? The popularising of calorie counting can be traced back to a Californian doctor, Lulu Hunt Peters and her best-selling book from 1922–1926, Diet and Health, with the Key to the Calories. It has now become the mainstay of weight loss advice, yet obesity rates worldwide are being termed an epidemic. In Australia, our overweight and obesity rates have significantly increased from 56.3% in 1995 to 63.4% in 2015. These levels were around 15% in the 1980s. Even the world’s largest diet company, Weight Watchers, dramatically changed their calorie counting system over five years ago because they found “calorie counting has become unhelpful”. David Kirchhoff, their CEO at the time, said they “needed a program that recognised that calories are most definitely not created equal”. Specific macro-nutrients requirements specific: Determining the correct protein to carbohydrates for your body type. Hormonal balancing: This includes the stress responses to our insulin (the fat storage hormone) levels. Nutritional approach: Ensuring critical micro-nutrient absorption via quality unprocessed foods, essential fats and sugar intake. Addressing emotional eating behaviours: The best diet will not overcome binge eating from emotional or stress based responses. Individualised exercise prescriptions for different personalities and body types. 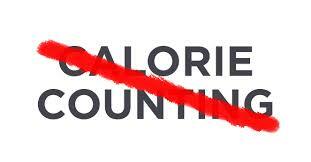 I can safely say that counting calories is not working. If you are looking to lose weight long term and not be a ‘regainer’, you now have many more options to help you achieve better health and a better body.